Combine the butter, sugar, egg, almond extract, and vanilla extract in a mixing bowl. Beat together with an electric mixer; gradually add the flour, chocolate chips, baking powder, and salt, continually beating; refrigerate 20 to 30 minutes. Remove dough from refrigerator in small amounts. Scoop 1 heaping teaspoon at a time onto a piece of waxed paper. Use the waxed paper to roll the dough into a thin finger-shaped cookie. Press one almond slice into one end of each cookie to give the appearance of a long fingernail. Squeeze cookie near the tip and again near the center of each to give the impression of knuckles. You can also cut into the dough with a sharp knife at the same points to help give a more finger-like appearance. Arrange the shaped cookies on the baking sheets. Remove the almond from the end of each cookie; squeeze a small amount of red decorating gel or strawberry preserves with red food coloring into the cavity; replace the almond to cause the gel to ooze out around the tip of the cookie. great picture these came out fantastic! These were a HUGE hit at in the office. Everyone took pictures to send to friends. I've never been so hesitant to eat a cookie in my life! Seriously chilling to eat because they were so scary looking. I can't recommend these enough to impress your friends. John, they turned out great! The hostess put them front and center and they were lit by the jack-o-lantern. Thanks! Excellent recipe!! Glad you liked them Kim....and thanks for the review! this looks great, i am definitely going to try this next year, thanks John! Wow John....this is the perfect "Trick AND Treat"! Glad you like it Sowmya! 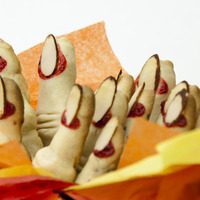 We are making these today as a last minute addition to the Halloween Party we are attending this evening! Love the photo! Hey John- Do you think these could be piped out of a large piping bag with no tip? They would be easier to form that way.